Purpose: To compare central corneal thickness (CCT) measurements obtained by the AL-Scan, Lenstar LS900, Galilei, and ultrasound pachymetry (UP) in normal and cataractous eyes. Methods: Eighty eyes of healthy subjects were included in the study. Each subject was assessed by four different methods of measurements using the AL-Scan, Lenstar LS900, Galilei, and UP by a single examiner. To assess the intraobserver repeatability, three consecutive measurements were taken for the AL-Scan. Results: The mean CCT [± standard deviation (SD)] for the AL-Scan, Lenstar LS900, Galilei, and UP were 554.6 ± 30.9 μm, 542.9 ± 31.3 μm, 570.7 ± 30 μm, and 552.7 ± 32.8 μm, respectively. The differences between pairs of mean CCT for the methods are statistically significant for the pairs of Galilei–UP, AL-Scan–Galilei, and Lenstar LS900–Galilei. Bland–Altman plots showed that AL-Scan–UP have the closest agreement, followed by Lenstar–UP and AL-Scan–Lenstar. Galilei was found to have the poorest agreement with the other three methods. The intraobserver repeatability of the AL-Scan was very good with an intraclass correlation coefficient (ICC) of 0.980. Conclusion: We found that CCT measurements between the AL-Scan–UP, Lenstar LS900–UP, and AL-Scan–Lenstar LS900 showed very strong correlation and comparable agreement. AL-Scan–UP showed the closest agreement and these devices can be used interchangeably in clinical practice. Galilei significantly showed higher value of CCT compared to other methods. It was also observed that the Al-Scan had excellent intraobserver repeatability. Precise measurement of the central corneal thickness (CCT) is clinically important in ophthalmic procedures and diseases. Corneal pachymetry is used for the diagnosis and management of glaucoma and for the evaluation of patients undergoing refractive surgery. CCT also affects the measurement of intraocular pressure by applanation tonometry. Currently, several traditional and new sophisticated devices are used for CCT measurements, such as ultrasonic pachymetry (UP), confocal microscopy, scanning slit topography, rotating Scheimpflug imaging, optical coherence tomography (OCT), partial coherence laser interferometry (PCI), and optical low-coherence reflectometry (OLCR). These devices use different measurement technologies and may give different results. Although UP is the gold standard for measuring CCT, it is a contact method and has some disadvantages such as patient discomfort, risk of infection, and corneal epithelial damage. It also may cause measurement errors because of corneal indentation and paracentral placement of the probe. Because the exact value of the corneal thickness is unknown, it is impossible to calculate the accuracy of measurements with any device currently used. Therefore, when evaluating new devices for CCT measurements, there should be an agreement between new devices and UP which is considered to be a gold standard. A non-contact pachymetry device can be used interchangeably with UP if it has good repeatability, reproducibility, and good limits of agreement (LoA) with UP. The purpose of this study was to compare CCT measurements obtained by the AL-Scan, Lenstar LS900, Galilei, and UP in normal and cataractous eyes. Eighty eyes of healthy subjects who were assessed in Ondokuz Mayis University, Ophthalmology Department were included in the study. The study was approved by the ethics committee of the university and also followed the tenets of the Declaration of Helsinki. Written informed consent was obtained from each participant. Each subject was assessed by four different methods of measurements using a new optical biometer (AL-Scan; Nidek Co., Ltd, Gamagori, Japan), the OLCR device (Lenstar; LS900, Haag-Streit AG, Koeniz, Switzerland), dual Scheimpflug imaging device (Galilei G2 v5.2.1; Ziemer Group, Port, Switzerland), and UP (PachPen; Accutome Inc, Malvern, PA) by a single examiner (Mustafa Duran). The AL-Scan is an optical biometry device based on the partial coherence interferometry (PCI). The device measures six variables, including the axial length (AL), keratometry (K) readings, CCT, anterior chamber depth (ACD), white-to-white (WTW) distance, and pupil size. It uses an 830-nm infrared laser diode for AL measurement and double-mire rings projected onto the cornea for the measurement of K readings. It also uses Scheimpflug imaging technique for CCT and ACD measurements. The Lenstar LS900 optical biometer uses the technology based on OLCR with an 820 mm superluminescent diode. It measures AL, CCT, aqueous depth (the measurement from the corneal endothelium to the anterior lens surface), K readings, crystalline lens thickness, and retinal thickness with this technology. The K readings are analyzed by the anterior corneal curvature at 32 reference points orientated in two circles on the cornea. The Galilei dual Scheimpflug analyzer is an optical device designed for the analysis of the anterior segment of the eye. It has dual rotating Scheimpflug camera integrated with a Placido topographer. Slit images captured from opposite sides of the illuminated slit and the elevation data obtained from corresponding opposite slit images are evaluated together. The posterior corneal surface detection is improved by dual Scheimpflug imaging and accurate CCT measurement across the entire cornea is achieved even if the camera is decentered with the eye movements. Measurements were performed at least 3 h after waking up to avoid the effects of diurnal variation on corneal thickness. Non-contact assessments were performed as described in the literature.,, The order of optical devices was random as they are non-contact devices. After the subjects were positioned on the head rest, they were asked to look into the fixation targets within each device. To assure proper head position, the temporal lid canthus of the eyes was adjusted to the engraved lines on the holding bars of the chin rest of each device. Furthermore, alignment was also checked on the measurement screen on the devices. Subjects were asked to blink just before each measurement was taken. After each measurement, subjects were then asked to take off their head from the chin rest, blink, and return to the examination position. Meanwhile, the device was realigned for the next scan. Three consecutive measurements were taken for examination with the devices. Following the non-contact examination, UP measurement was performed last. The corneas were anesthetized using 0.5% proparacaine hydrochloride. The measurement was performed after 60 s of drop application to avoid the increase of corneal thickness secondary to topical anesthesia. Great care was taken placing the probe to the center of corneal surface. When comparing different devices, the mean value of the measurements was used. To assess the intraobserver repeatability of AL-Scan, three consecutive measurements were taken. Because that intraobserver repeatability of other devices has been evaluated before in other publications, intraclass correlation coefficients (ICCs) were estimated to assess the intraobserver repeatability for only measurements with AL-Scan as it was a relatively new device. Statistical analysis was performed using the SPSS (SPSS for Windows, version 15.0, SPSS, Chicago) and MedCalc version 12.7 (MedCalc Software, Mariakerke, Belgium). To detect a difference in mean CCT of 10 μm at a significance level of 5% and a power of 80%, 52 eyes were required and we added 28 eyes to compensate for possible dropouts. Therefore, we recruited 80 eyes for the purpose of the study. Analysis of variance (ANOVA) and the Tukey's multiple comparison tests were used for the comparison of four different methods. A P value < 0.05 was considered statistically significant. The Bland–Altman plots were used to evaluate the agreement of measurements between pairs of the devices. If the 95% LoA were within allowable clinical margins, two methods were said to be in good agreement. The mean age (±SD) of the subjects was 33.6 (±9.7) years (range: 19–66 years) and 53% of subjects were women. The mean CCT (±SD) for the AL-Scan, Lenstar LS900, Galilei, and UP were 554.6 (±30.9), 542.9 (±31.3), 570.7 (±30.0), and 552.7 (±32.8) μm, respectively. Measurements showed that the differences between pairs of mean CCT for the methods are statistically significant for the pairs of Galilei–UP, AL-Scan–Galilei, and Lenstar LS900–Galilei, whereas are not statistically significant for the pairs of AL-Scan–UP, Lenstar LS900–UP, and AL-Scan–Lenstar LS900 as shown in [Table 1]. The Bland–Altman plots were also used to examine the agreement between pairs of methods as shown in [Figure 1]. It was observed that AL-Scan–UP have the closest agreement, followed by the Lenstar–UP and AL-Scan–Lenstar LS900. Galilei was found to have the poorest agreement with the other three methods. Measurements with Galilei were significantly thicker than other instruments. The intraobserver repeatability of AL-Scan was very good with an ICC of 0.980. Reliable and validated measurement of CCT is crucial for the clinical practice and interpretation of study results. So, it is important to evaluate the precision and the accuracy of the instruments before they become widely used in clinical practice and research settings. Ultrasound pachymeter has been used as the gold standard method for measuring CCT for many years. However, new optical methods have the great advantages as they are non-contact methods and do not require topical anesthesia. In this study, we compared the agreement of four different methods, namely AL-Scan, Lenstar LS900, Galilei, and UP. Although there was a high correlation between all the methods used in this study, we found that AL Scan–UP showed the closest agreement, followed by Lenstar–UP and AL-Scan–Lenstar. Beutelspacher et al. compared CCT using the Lenstar LS900, Pentacam, OCT, and UP and noted the closest agreement between the Lenstar LS900 and UP. Koktekir et al. compared the accuracy of Lenstar LS900 and conventional UP (US 4000; Nidek, Japan) for measuring CCT and found a close correlation and a higher agreement between the two methods. Our good agreement with the new optical biometry device and previous data may increase the likelihood that optical biometry devices show the closest agreement with UP. In the Bland–Altman analysis, we found a very small mean difference of approximately 1.9 μm and a relatively narrow 95% LoA of − 19.7–23.4 μm for CCT measurement between the two devices. We found that the mean differences between the Galilei and other devices are statistically different. Our results are in accordance with the study by Jahadi et al. in which the measurement by Galilei was statistically significantly thicker than those by the Pentacam or UP. On the contrary, Ladi and Shah and Menassa et al. reported that CCT measurements with Galilei were not significantly different from those by other modalities including UP.,, In our study, Galilei showed higher values of CCT compared with the other devices. Although the Scheimpflug system provides more accurate images as it acquires a wide depth of focus and sharp images, these large differences are an issue that should be evaluated in the future with the studies enrolling much bigger sample sizes. Despite the CCT is calculated from a rotating Scheimpflug camera by the AL-Scan optical biometer, the discrepancy between the two devices that use rotating Scheimpflug camera for CCT measurements is also a question that needs further investigation. Besides agreement analysis, which studies the similarity of measurements between devices, we have performed the repeatability that measures the precision of a device. Because the repeatability of other methods has been studied before, we decided to evaluate the repeatability of AL-Scan only as it was a relatively new device. We found the ICC to be 0.980 for the AL-Scan. CCT measurements between AL-Scan–UP, Lenstar LS900–UP, and AL-Scan–Lenstar showed very strong correlation and comparable agreement. AL Scan–UP showed the closest agreement. CCT measurements with Galilei were more far away from those by other devices. Therefore, Galilei may not be an alternative to UP for measurement of CCT as it may lead to misinterpretations of results such as better residual bed thickness and greater risk of corneal ectasia in refractive surgeries. Considering that the AL-Scan and Lenstar LS900 have very strong correlation with UP, optical biometer devices can be an alternative to UP for measurement of CCT. Non-contact features and fast acquisition time of the AL-Scan and Lenstar LS900 provide some practical advantages for the patient and ophthalmologist in clinical settings. Lopez-Miguel A, Correa-Perez ME, Miranda-Anta S, Iglesias-Cortinas D, Coco-Martin MB, Maldonado MJ. Comparison of central corneal thickness using optical low-coherence reflectometry and spectral-domain optical coherence tomography. J Cataract Refract Surg 2012;38:758-64. McLaren JW, Nau CB, Erie JC, Bourne WM. Corneal thickness measurement by confocal microscopy, ultrasound, and scanning slit methods. Am J Ophthalmol 2004;137:1011-20. Barkana Y, Gerber Y, Elbaz U, Schwartz S, Ken-Dror G, Avni I, et al. Central corneal thickness measurement with the Pentacam Scheimpflug system, optical low-coherence reflectometry pachymeter, and ultrasound pachymetry. J Cataract Refract Surg 2005;31:1729-35. Prospero Ponce CM, Rocha KM, Smith SD, Krueger RR. Central and peripheral corneal thickness measured with optical coherence tomography, Scheimpflug imaging, and ultrasound pachymetry in normal, keratoconus-suspect, and post-laser in situ keratomileusis eyes. J Cataract Refract Surg 2009;35:1055-62. Rainer G, Findl O, Petternel V, Kiss B, Drexler W, Skorpik C, et al. Central corneal thickness measurements with partial coherence interferometry, ultrasound, and the Orbscan system. Ophthalmology 2004;111:875-9. Beutelspacher SC, Serbecic N, Scheuerle AF. Assessment of central corneal thickness using OCT, ultrasound, optical low coherence reflectometry and Scheimpflug pachymetry. Eur J Ophthalmol 2011;21:132-7. Srivannaboon S, Chirapapaisan C, Chonpimai P, Koodkaew S. Comparison of ocular biometry and intraocular lens power using a new biometer and a standard biometer. J Cataract Refract Surg 2014;40:709-15. Buckhurst PJ, Wolffsohn JS, Shah S, Naroo SA, Davies LN, Berrow EJ. A new optical low coherence reflectometry device for ocular biometry in cataract patients. Br J Ophthalmol 2009;93:949-53. Huerva V, Ascaso FJ, Soldevila J, Lavilla L. Comparison of anterior segment measurements with optical low-coherence reflectometry and rotating dual Scheimpflug analysis. J Cataract Refract Surg 2014;40:1170-6. Zadnik K, Mutti DO, Adams AJ. The repeatability of measurement of the ocular components. Invest Ophthalmol Vis Sci 1992;33:2325-33. Koktekir BE, Gedik S, Bakbak B. Comparison of central corneal thickness measurements with optical low-coherence reflectometry and ultrasound pachymetry and reproducibility of both devices. Cornea 2012;31:1278-81. Jahadi Hosseini HR, Katbab A, Khalili MR, Abtahi MB. 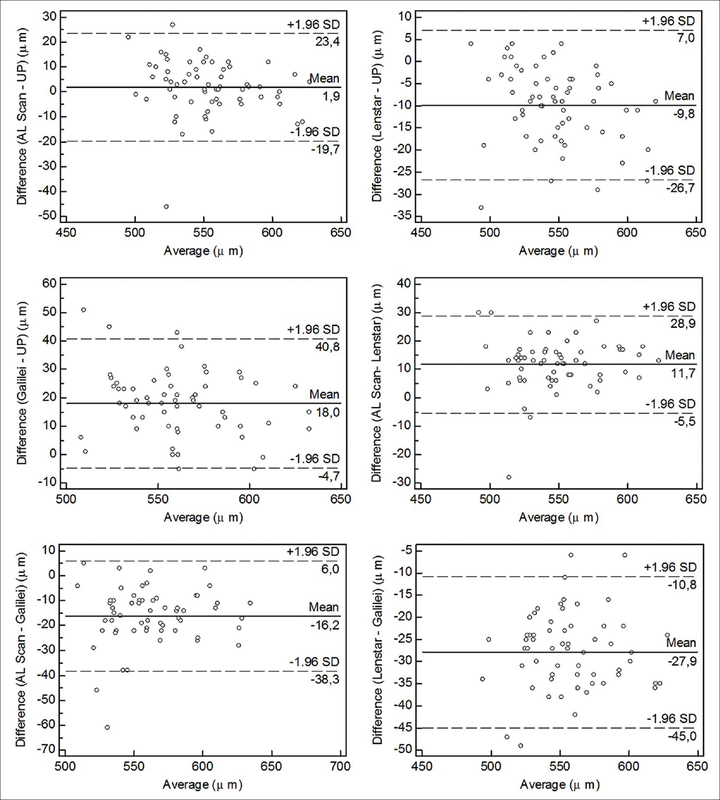 Comparison of corneal thickness measurements using Galilei, HR Pentacam, and ultrasound. Cornea 2010;29:1091-5. Ladi JS, Shah NA. Comparison of central corneal thickness measurements with the Galilei dual Scheimpflug analyzer and ultrasound pachymetry. Indian J Ophthalmol 2010;58:385-8. Menassa N, Kaufmann C, Goggin M, Job OM, Bachmann LM, Thiel MA. Comparison and reproducibility of corneal thickness and curvature readings obtained by the Galilei and the Orbscan II analysis systems. J Cataract Refract Surg 2008;34:1742-47.